I'm not sure this post is in the right sub-forum. Perhaps on of the admins can move it to a more appropriate location where people will see it and respond. This should be easy enough to figure out if it will work, providing you have a few basic tools like a multi-meter that can measure resistance. Power up your model and use the variable knob to set what ever it is you are trying to set to it's various configurations. If it works, note the positions of the knob you are interested in. Power everything down. Carefully un-solder the leads to the potentiometer. Measure the resistance at the various positions. Before removing the potentiometer or modifying the case, temporarily wire up your 3 position switch with the appropriate resistors in the circuit. Test it out. If it works - great! If not, you can still put it back together as it was with any permanent damage. They can describe it better than me. Sounds more like what the op wants.i like the idea of not replacing the pot and just adding a switch to allow selecting between pot and fixed values. Theres also a circuit diagram to a resistor ladder that seems to be exactly what the op is looking for. This is the basic diagram to do it. I put down a slider as the selector because they are smaller and you wouldn't knock it easily in flight by mistake. There is no need to add resistors as when the pot is in full throw on one side or the other, the signal wire is in direct contact with the positive or negative depending on which way you have turned it. You won't be burning anything out as there is a resistor already in line with the signal wire due to the fact that it started out life as a pot. On that diagram they are adding it for centring reasons, but there is no need as when there is no signal going into the pot signal it is centred. If you want to test out the theory, put a switch in line with the signal wire you have on the pot... when the switch is on, the servo will be positioned depending on where the pot is, but if you turn the switch off, the servo will centre (unless you have some weird setup in your radio, which I have never seen). I have done this tupe of mod on several transmitters and it works fine without resistors or a 1P3T switch. There is no need to add resistors as when the pot is in full throw on one side or the other, the signal wire is in direct contact with the positive or negative depending on which way you have turned it. You won't be burning anything out as there is a resistor already in line with the signal wire due to the fact that it started out life as a pot. 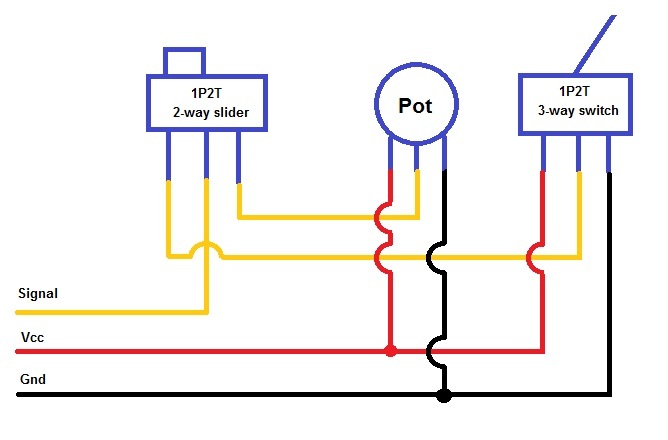 On that diagram they are adding it for centring reasons, but there is no need as when there is no signal going into the pot signal it is centred.